We are considered to be one of the professional manufacturers and suppliers of Wrought Iron Candle Wall Sconce. The products are easy to maintain, long lasting and hard-wearing. Intricately designed under the guidance of our expert craftsmen, these candle holders are developed at our state-of-the-art infrastructure unit with the aid of modern machinery and technology. Available in various designs, this is the combination of contemporary and traditional patterns and is widely used to enhance the decor of your living and working area. 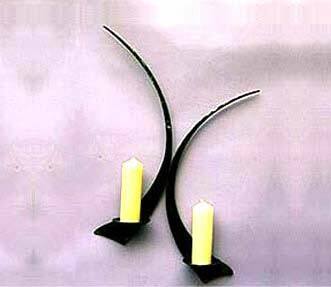 Description : Exhibiting modern artistic patterns, these wrought iron candle wall sconces will coordinate well with the interior decor of your living & working area.